Maybe one of the best composites? I'm mutually enamored with someone....quite a bit younger. Just kind of opening up to it - and the age difference makes me a little hesitant. But the little I know about composites makes me think that at least as a unit we might have some good stuff baked in... right? It seems like the most congruent one I've ever seen - would appreciate any analysis. Last edited by kenb; 11-14-2018 at 09:32 PM. Re: Maybe one of the best composites? Yes, quite an amazing composite. It's always a good idea to cross check with the synastry. A midpoint in the composite could result from a positive aspect or a negative one. 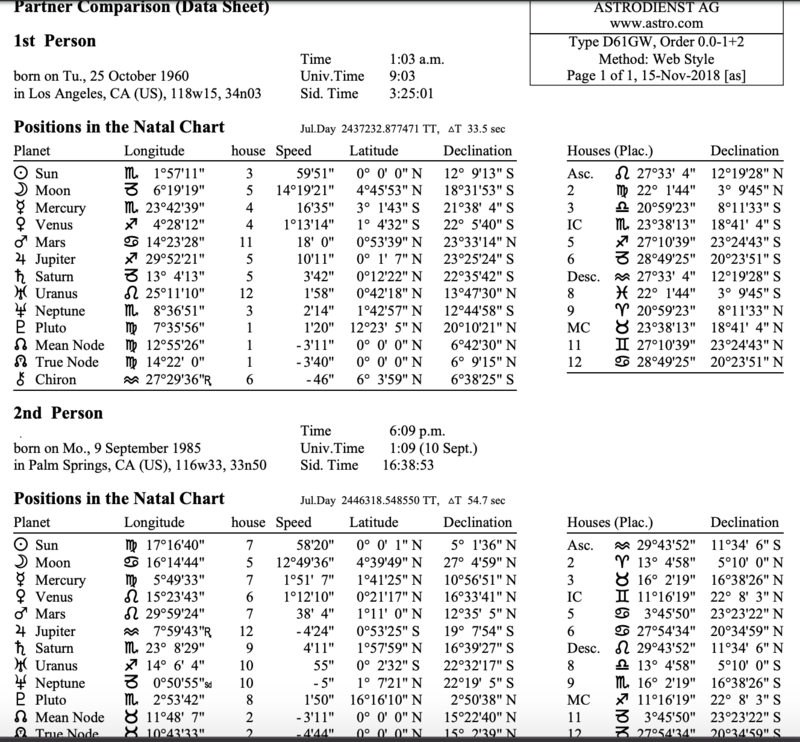 The composite and synastry should both be considered and weighed. Thanks! Appreciate the thumbs up. yes the synastry - seems not quite as much a shoe-in....though there's lots I like. I'm more of a Vedic astrologer...and there the opposite ascendents and moons are considered quite good. Last edited by kenb; 11-15-2018 at 02:05 AM. Last edited by kenb; 11-16-2018 at 05:19 AM. yep, it's very,very good. It has every feature I have seen in long-lasting relationships. The big stellium that is not in H6 or H12. The stellium is supported by sextiles to Mars, Saturn and Neptune. The nodal axis is square the stellium/luminaries which shows up with remarkable frequency in long lasting unions. Jupiter squares tend to be benign. There is some tension in the synastry that indicate intensity with Mars/Pluto and Sun/Pluto contacts . The Moon conjunct the others Mars adds to the feverish quality, and can make for very heated arguments but not necessarily fatal ones. Steven Forrest says (to paraphrase) these Mars/Moon synastric aspects indicate that you literally make each other's blood boil and you will always have strong feelings about each other whether those are good or bad feelings. Would anyone compare and contrast? Because luck would have it, there's this one around too..much more similar in age...which somehow feels more relaxed. 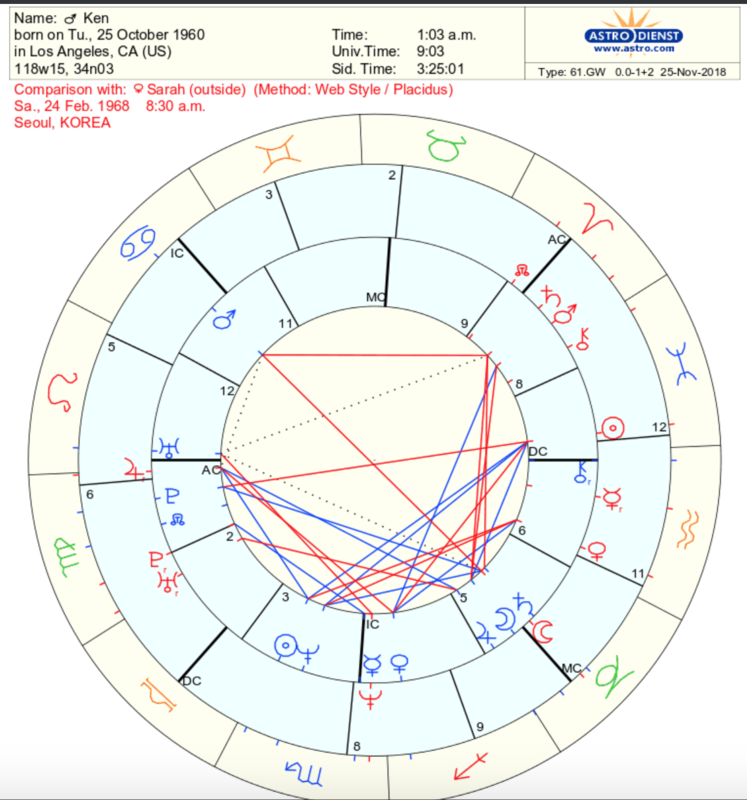 ... She is kind of an intense Mars/Saturn ascendant kind of gal, while I have the Mars/Saturn opposition - - and we make that T square? How to judge that 'bad' aspect in relation to the rest. I've read the 'timing is off'... and so far... seems a little true. Last edited by kenb; 11-24-2018 at 10:59 PM. So your Mars and Saturn are both out-of-bounds? and both of these potential partners have out-of-bounds Moons and one falls on your Mars/Saturn opposition? That could be quite interesting. I think the first one is the stronger composite but isn't she/he the one whose OOB Moon is on your Mars/saturn opposition? Don't know what to say about that exactly. Just went for a walk with the second one, and wow, it confirms my analysis pretty well... Mars/Saturn themes all over the place - in her (w/ the conjunction on her ASC)... but also a feeling of possibly 7th house ease. Difficult Mars/Saturn aspects in natals and in composites in cardinal signs suggest problems with timing. perhaps same is true with synastry and it explains some of the age difference issues.? I am just speculating here since I have not done a study of couples with these aspects in their synastry. The second composite shows a Mars/Saturn/Neptune T-square but I think the orb from Saturn to Neptune is wide and I would discount that. But the Mars/saturn square remains. This aspect tends to create situations where the partners often work at cross purposes since they seem to never be "in the mood" for the same things at the same time. The synastry with the first person, the younger one I believe, has some troubling synastry, more so than with the second person. Because she is much younger, do you think she has the maturity and commitment capacity to work through what these suggest? That would be a concern or me if were in your shoes. 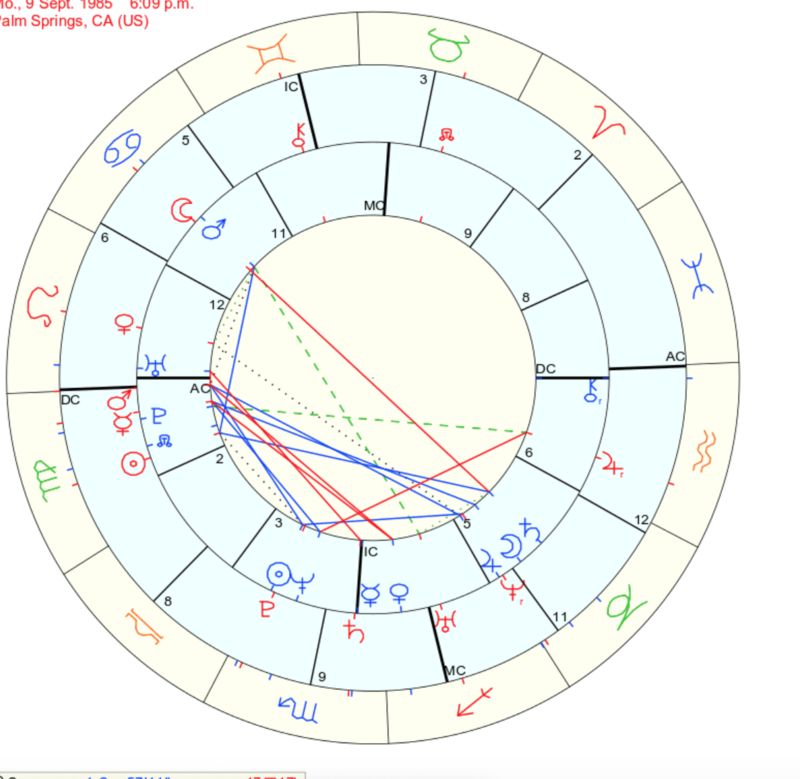 I am looking at your natal and trying to find a marker in the transits to explain this extraordinary luck to find two such great relationships possibilities at this time. Haven't found one. Any suggestions? The second one... is really having a hard time in her own life, with life period. Feels easy to engage if I wanted too, but i wouldn't want to wind up being the colder partner - like in the celebrities you describe. 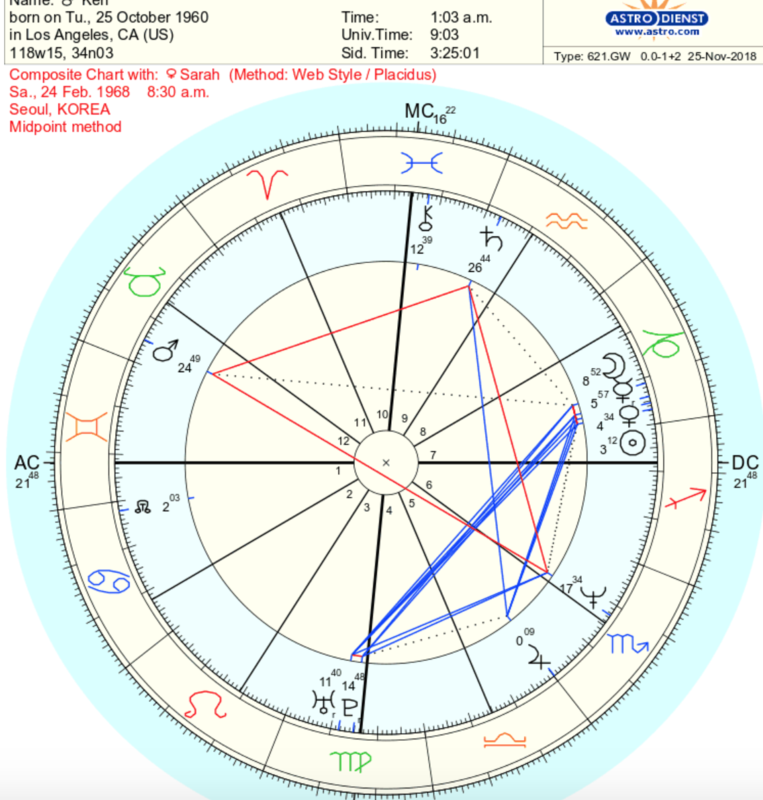 Feels maybe possible - her Mars trine my Venus has me feeling like her attraction to me is almost a given...weirdly as I've had not a lot of self-confidence in the past. As far as timing being off, I can see that too. Luck is a relative word here! Very interesting discussion, thank you for presenting it! I may be getting a little confused between all the charts, so hopefully my comments will be valid and correct. Early on you mention the ASC/DES being "flipped" between you and the first lady, and the moon's in opposition. The ASC/DES in this type of aspect literally would indicate that what you are looking for in a partner/marriage relationship (your descendent) is precisely how she presents herself, and vice versa, she sees in your Ascendent what her descendent is looking for, and this is a very strong and compatible tie, and enviable. The opposition of the moon's is up for discussion, as this puts you both in different places emotionally. In your case, the cancer moon looking for sentimentality finds a colder and analytical emotion coming from the Capricorn moon. This could work, depending on the other aspects, and also because it is rather weak here, being 10 degrees apart. A quick look at the synastry chart shows your mars on her moon, pulling you sexually, she seems very feminine to you and stimulates you. However her mars is semi-square with this, so very fiery physical attraction, but these two mars positions will be setting you both off emotionally, with some sparks flying and hurt feelings. She natally has a mercury/mars conjunction, so she is a quick thinker and can tend to loose her temper. And we find your pluto churning up this energy! This is really a strong pull, but on a daily basis, living together, you will want to have time to distance yourselves to avoid explosions and blow ups, while maintaining the physical attraction positive side. Capricorn moon will find itself squelched by Saturn, and Saturn will always win because the moon is in its fall in Capricorn, while Saturn is at home there. Coldness and emotional distancing. As mentioned already by someone else, the mercury/saturn and mercury/pluto are neither inducive to communications, which is a fundamental necessity in a relationship, once you get out of bed and start living life together. In addition, both Venuses are squaring the other's mercury, so you have difficulty sharing your ideas, you are on two different wave lengths! And the cherry on the cake is the sun/pluto that is very bossy, very transforming and can be overwhelming. Lady number two? Closer in age can be a positive or not. The stellium in the descendent is very compelling, but the Uranus/Pluto conjunction is a warning signal! In the synastry here again we can see the moon/mars theme playing out, but in this case the moon's are together, so sympathetic to one another. And the mars is physically drawing you together. And once again, the moon/saturn is present. (coincidence?). 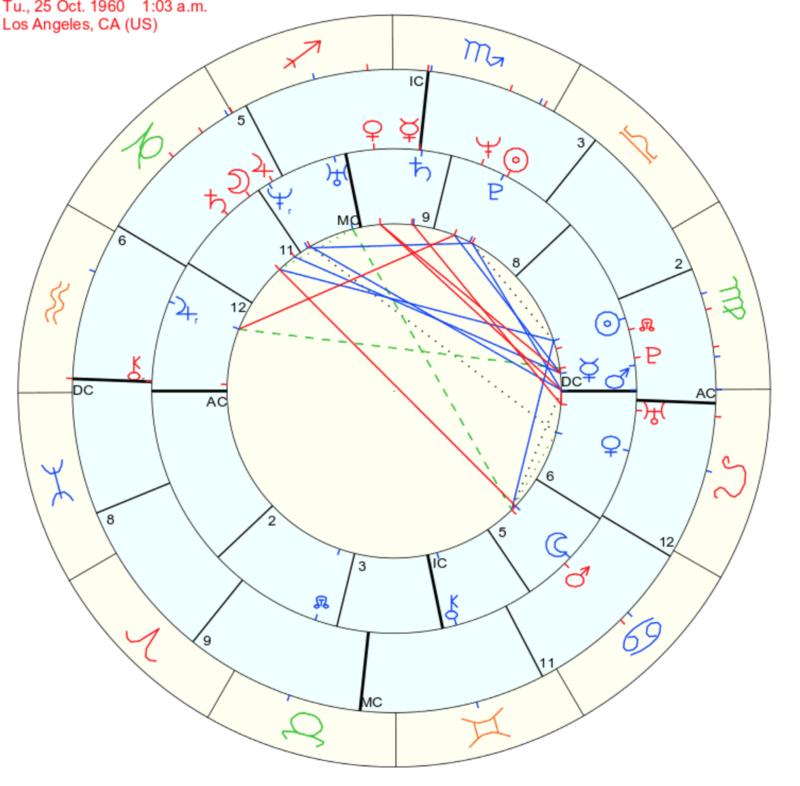 In this synastry however, the sun's are almost perfectly trined, and both aspecting each other's Jupiter, two aspects that can bail you out of a lot of tense situations when they come up! Understanding, generosity and tolerance between the two of you. Neptune is also involved here, adding a dreamy, romantic quality, and idealism to the relationship. This is carried out in the mercury/neptune conjunction. These are nice aspects, so long as the illusion doesn't turn into delusion. Then there is the mars/saturn in this relationship, that sets you off on different goals, and in a partnership where you are not pulling together but one against the other, one pushes the other pulls. However, you have this contradictory mars/saturn energy in your natal, so it may be a type of energy that you are used to living with? So how do the ascendents work out? Her Jupiter, out of sign, is on your ascendent and will certainly make you feel like the world is your oyster, you want to express yourself to your fullest, she makes you expand and beam! I don't see the ascendent degrees but it looks like late degrees of Leo and aires, which is a trine, and very compatible. Two fiery personalities. The Leo personality with Aquarius on the descendent needs breathing space in a relationship, while the aires with libra on the descendent wants to be in a close partner relationship. There is a close Venus/saturn trine between you two, so you can work this out fairly easily. With her sun out of sign but on your descendent, which is also a very strong tie considering your ascendent ruler is the sun, she gives a "sunny" quality to the partnership that you will find very attractive and it is a type of energy that you recognise very well. That Jupiter is also her sun ruler. Your natal moon, indicator of the type of woman you will tend to seek out, is with Jupiter and Saturn and opposed to mars. So she will be serious but jovial, and also spirited. This lady has her moon in serious Capricorn, Jupiter is her sun ruler, and her ascendent is fiery aires ruled by mars. No wonder you are drawn to her! I do hope I haven't mixed up the aspects between the wrong charts, but as I wrote earlier, this comparison really is extremely interesting and intriguing and I did want to offer whatever insight I could, so hope it is ok, and I apologise if I wrote too much. The final choice of course is in your heart, but please let us know how it works out! Last edited by ElenaJ; 11-26-2018 at 07:29 PM. Well, I took a good look at your transits - not too shabby after all. Jupiter very close to conjunct your Venus, and Uranus is coming into a trine with your Jupiter which is the H5 ruler. Uranus Jupiter aspects are the luckiest of all and bring opportunity. There's a few underlying conceptual issues here I think also. Obvious one being synastry vs. composite... if the composite has to be 'actualizied'....at what point is it? Overall seems like you speak more highly of the second chart... Maybe its like an S/N ration: First chart being maybe 30/95, the second more like 75/60.... or something like that. Of course no good/bad here - its all in the doing. 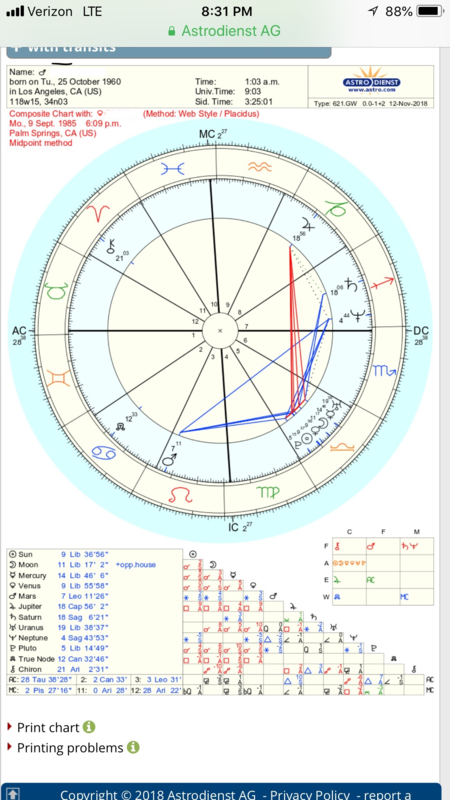 Wouldn't the Uranus/Pluto pluto conjunction be kind of generational? Last edited by kenb; 11-28-2018 at 02:10 AM. 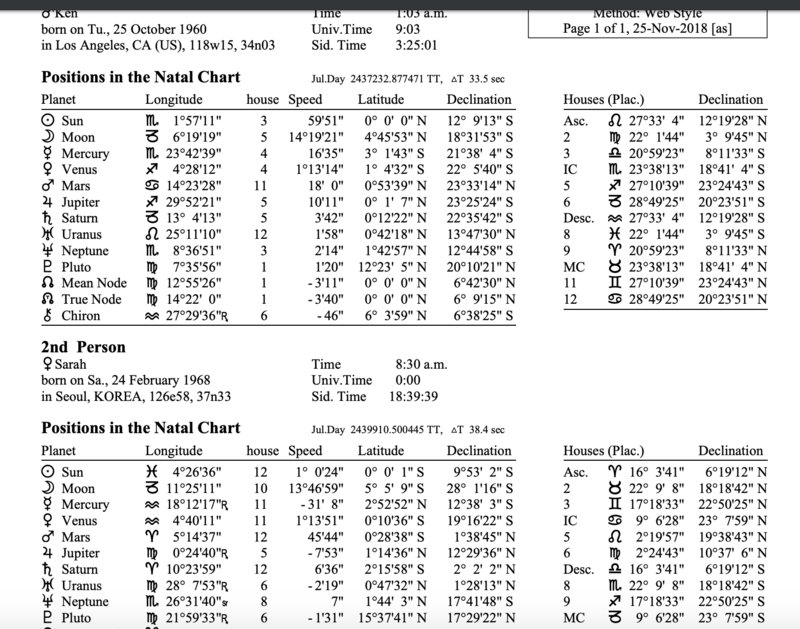 Here is a good video explaining the difference between the synastry and the composite charts.